How can my business be included? 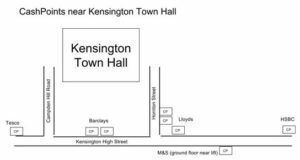 Please click here for helpful advice how to get to Kensington Town Hall. Those who arrive before the opening time of 10.30am will find a queue winding its way down towards Kensington High Street. Some people arrive very early as they are keen to get the best choice of bears from one or other artist but otherwise the main advantage to arriving much before 10.30am is the free chocolates passed down the line. If you are coming by car it’s possible that the underground car park at the venue will be full by mid-day so the earlier you arrive the better chance there is of getting space (otherwise the alternative is in the nearby Young Street car park – which unfortunately costs more). Just keep in mind that the car park is remarkably cheaper after 9am. Tickets cost £5 on the day for adults (from age 18), children have free entrance. Festival programmes are sent out approximately 3 weeks prior to each event to our mailing list. 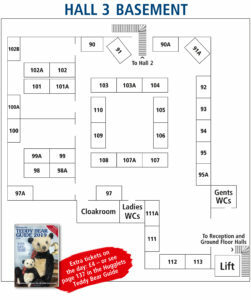 The Teddy Bear Guide contains the contact details of most exhibitors as well as two free tickets for each event – and a lot more besides. If you prefer to purchase the Guide in advance you can order it online here. The queue often gets very long but despite this we usually manage to get everyone in within ten minutes because tickets are already held. 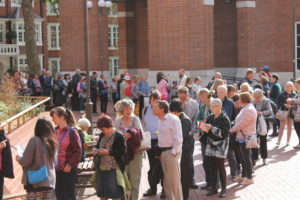 If someone in the queue doesn’t already have their ticket they just step aside when they get to reception – we sell as fast as possible but a short delay for these ticket buyers is inevitable. The venue is suitable for wheelchair access (please come directly to reception via the entry point higher up Hornton Street to avoid external stairs). An internal lift is available between the three floors as well as the internal stairs. There are toilet facilities on both the top floor and basement but disabled toilet facilities are limited to the basement. Official guide dogs may enter the venue but other pets are not allowed. Before handing in your ticket at the inner door (just past reception) please make sure you complete the prize draw details on the back to stand a chance of winning one of three £50 vouchers to spend at the event. Winners are announced and invited to collect the voucher from reception. 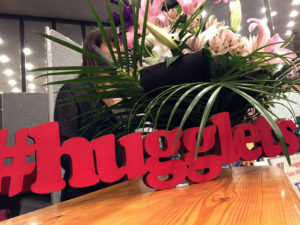 If you need to leave early don’t worry – if you win a prize we’ll post the voucher to you to spend at the next Hugglets Festival. If at any time you need to leave the venue and return please ask for a pass-out card as you go out. Not all exhibitors can take cheque or card payments, especially those from overseas, so it’s a good idea to have sufficient cash for your proposed purchases. 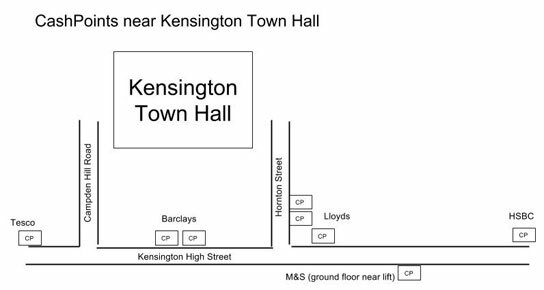 You may need to visit one of the nearby cashpoints/ATMs on Kensington High Street (the nearest are at the corner of Hornton Street). If you have coats and bags with you, you can deposit these at the free cloakroom in the basement (hall 3). You can also use this facility if your purchases mount up during the day – but don’t forget to collect them. 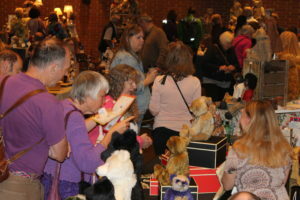 From the point you enter the event everything is open to you – over 10,000 teddy bears and related collectables (including rabbits, cats, monkeys, dogs etc) on sale in an enormous variety of styles, sizes, colours, ages and prices. The event takes place on all three floors and in four different halls. The ground floor has halls 1 and 2 (the first one you come to is actually hall 2). The top floor is called hall 4 and the basement hall 3. 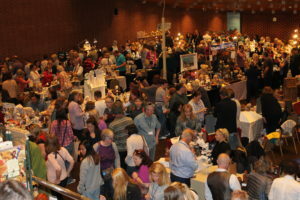 Many people find it helpful to review the list of exhibitors before the event. If you’ve not already received one in the post a floorplan showing exhibitor positions will be available on the day from the reception area. You can collect one when you arrive and review it while waiting in the queue. You can view the exhibitor list and basic floorplan on our website in order to plan the order of your visit. It’s a good idea to identify any stands you particularly want to visit early in the day when more bears are still available. But don’t forget to look around and allow yourself to discover new things. There are always new exhibitors and young talents worth your attention. If there are cancellations, additions or changes to the published programme these are posted in various places as you enter the venue. In the Online Exhibitor List we also provide clickable links to take you to the websites of our exhibitors. This is great for previewing the sorts of bears offered by each exhibitor. 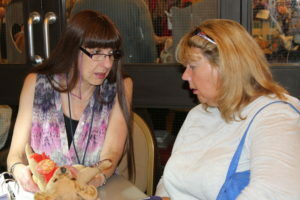 The links remain available on the site for a while after the event to help you track down an exhibitor if you later regret not buying one of their bears. 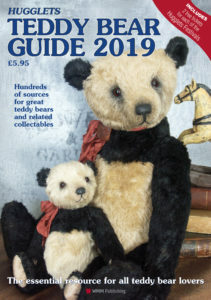 If you are especially intent on buying a particular bear or a bear from a particular artist it may be worth contacting the exhibitor in advance in case a bear can be reserved, or perhaps you can buy in advance and collect on the day. There are so many great bears it will be hard to know where to begin. 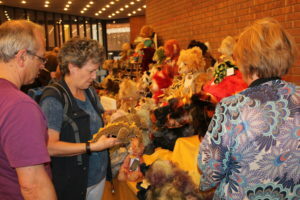 Most of the leading teddy bear makers in the UK will be there as well as remarkable artists from all over the world. Hugglets Festivals also offer a rare opportunity to meet bear artists and other exhibitors from overseas – so you’ll not want to miss these. There are usually about 60 exhibitors from overseas. They are located through all the halls but can be readily identified on the printed exhibitor list. Countries often represented include Austria, Belgium, Canada, Denmark, France, Germany, Ireland, Japan, The Netherlands, South Africa, Sweden & USA. A quick word about photography – if you want to take photos we won’t be surprised because the displays are wonderful and the artistry amazing – but please ask permission of the exhibitor first. Just past the reception area you’ll see a bear repairer. You may be lucky to find a repair can be done on the day but often teddies need to become in-patients. 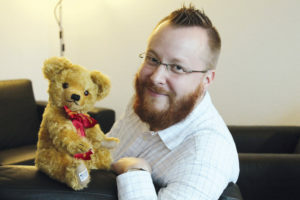 If you are thinking of selling an old bear there are many dealers in old bears who may be pleased to see your bear and perhaps make an offer. One or more specialist toy auctioneers may also have a stand and so be able to advise you. By now you might be getting hungry. On the top floor you’ll find the snack bar. An alternative is to take a break outside at one the local eateries or find a seat in the balcony area overlooking hall 1 and break out the sandwiches. If you do go out for food please note that fast food cannot be brought back into the premises so you’ll need to finish it outside. If you are coming with a party it is a good idea to arrange a meeting time and place in case you split up. Sorry, we generally won’t make public announcements to reunite you with your friends, but we make an exception if children are lost. On the subject of things being lost, please keep hold of your bags. You may need to put them down to cuddle an irresistible bear from time to time but remember to pick them up again. If you do lose something please report it to the Hugglets reception at the entrance. We’ll take your contact details and reunite you with your property if it is handed in. If you find something, please bring it to reception and if it is next to a stand please also bring it to the attention of the exhibitor. In case you feel unwell during the event (overwhelmed by all the bears?) there are two St John Ambulance staff on site to help you – please ask at reception. The event finishes at 4.00pm so you’ll want to regroup and make sure you’ve visited all the halls before then. At 3.45pm we’ll make an announcement to recommend you make your final purchases before the journey home. If you have left items in the cloakroom please collect them. Anything still there at the end of the day will be transferred to the Hugglets reception desk. If you are hoping to get a taxi we advise you to walk down to the main road and hail one from there. Phoning for a cab is not always successful. If you have parked in the car park, you’ll need to pay at the machine or at the manned booth before rejoining your car. The car park only accepts card payments. Have a safe journey back and we hope your adopted bears settle well into their new home. If you have taken pictures of your day or wish to write an account of your visit please send us a copy – we may be able to include it on our website or feature it on Facebook. We’ll be happy to have you with us. Not all exhibitors can take cheque or card payments, especially those from overseas, so it’s a good idea to have sufficient cash for your proposed purchases. In case you need some cash we offer a cash service at reception. We accept all major debit and credit cards, but have to charge a fee of 3% for this service. Alternatively you may need to visit one of the nearby cashpoints/ATMs on Kensington High Street (the nearest are at the corner of Hornton Street). 1. The best option (if it works for you) is to connect to the free Wi-Fi network RBKC_VENUES. After connecting open your browser and you’ll be prompted to enter a code (available from reception for exhibitors only). Devices must accept cookies. 3. If you have a good mobile signal and you are using a smartphone with a data allowance you’ll be able to access the internet on your phone or else you could set up your own wifi hotspot. Please check your own phone settings for how to do this. The basic idea is that your phone will broadcast a wireless network with a password that you set, then connect as normal on your computer or tablet. Please note that not all mobile phone networks will penetrate all parts of the building so you’ll need to find a signal if necessary. nb. We’d appreciate any feedback you can give on mobile and wifi reception so we can establish which networks work best in various parts of the building.